Banteay Chhmar is still in ruins and it isn't easy to get to, but the lucky few who make the journey find serenity and solitude. It's early on a Sunday morning in Cambodia, and I'm standing at a 12th-century moat. Traces of mist hover above the lotus leaves that dapple the water. Across a causeway, through a tumbled-down gate, lies Banteay Chhmar, one of the largest temples ever built by the ancient Khmer Empire. My friends and I are going to have the place all to ourselves. We walk in. It turns out that we do end up sharing it, with a local man who brings his cows onto the grounds to graze. And with an affable mason who leads us across acres of fallen stone to see a message from the past, an inscription chiseled into the doorjamb of a holy tower. This kind of company we welcome. Cambodia's great temples of Angkor, 65 miles away, have long since been rediscovered after a quarter-century of being closed by war. They now draw more than a million foreign visitors a year, not a few of whom regret that so many other people had the same idea. At peak hours, human traffic jams can form at temple steps once reserved for kings and priests. But go beyond Angkor and you can find places that serve up the old solitude and sense of discovery. You can explore at your own pace, to the sounds of birds and the breeze that stirs the leaves overhead. In postcards and e-mails home, you will search for words worthy of your sentiments of wonder. Banteay Chhmar is among the most spectacular of these places. Getting to it entails hours on bumpy and dusty dirt roads. Staying the night means making do with primitive accommodations: candlelit rooms in local homes, bath water drawn from that same moat. I stayed the night, and it turned out to really make the visit. The next morning I rose early, as everyone here does, and took a walk in clean country air. I passed mother hens foraging with their chicks, boys tending to a mud oven in which charcoal was being made. I was seeing not only a temple but a way of life. Today several thousand people -- rice farmers, cattle herders, market vendors -- make their homes on all four sides of the temple. They grow vegetables on the banks of a series of moats; they pile straw within the walls of lesser ancient buildings that dot their settlement. The ancient and present day coexist. Spending time here also means doing a good turn, spreading a bit of wealth in a part of a war-recovering country that has largely missed out on the tourist dollars that Angkor is bringing in. People do have cell phones (charged by generator), and some have small tractors, but there are few other signs of affluence here. Banteay Chhmar was created in the Khmer Empire's last great burst of construction, under the 12th-century Buddhist king Jayavarman VII. His engineers were thinking big even by Khmer standards: To contain a great settlement, they built earthworks and moats that formed a square measuring roughly one mile on each side. At its center, within another square moat system half a mile on each side, they built the temple. More than a century ago, French archaeologist Etienne Aymonier found the temple to be in a state of "indescribable ruin." It still is, despite the efforts of that friendly mason, who is part of a small reconstruction team. But that's part of what makes the site so enticing. Exploring it means climbing over piles of large fallen stones, something to be tackled by only the sure-footed. We passed ruined towers, courtyards and ceremonial walkways. Sometimes the stones were so high that we were walking at roof level. The temple is no longer a formal religious site, but Cambodians believe that it, like all those that their forebears left behind, remains a holy site. In one surviving chamber we found a small contemporary shrine, with a Buddha image wearing a cloth robe, where people made incense offerings. When rain is needed, local people are reported to walk in a procession around the temple, imploring heaven to help. One of the best parts of this temple is the many hundreds of feet of bas-reliefs on its outer walls. We had to scramble up more stones to get a good view. Before us was a full sample of life 900 years ago: processions of elephants, prominent ladies tended by maids, children roughhousing, villagers in a sampan, servants tending a stove. There were also many scenes of war with Champa, the long-vanished rival state to the east: The temple is in large part a memorial to four generals who lost their lives in that long conflict. On land, the men of arms go at one another fiercely with spears (you can identify the Chams by the curious blossom-shaped headdress they wear). On water, rows of men pull at oars from galleys as others strike at the enemy with spears. There are also images of the divine, notably the god Vishnu, with 32 arms arrayed like rays of light emanating from the sun. The carving style is similar to that of the Bayon temple reliefs in Angkor. The difference is there's no need to fight for a view. We did cross paths for a few minutes our first day with a party of about 20 French-speaking tourists. We saw no other visitors that day or the next. Late in the afternoon, we went for a look at what the ancient Khmers could do with water. Just east of the temple, they created a reservoir that measures roughly a mile by a half-mile. Academics disagree over whether this body, and others like it, did only symbolic duty as earthly stand-ins for the mythic Sea of Creation, or were part of a vast irrigation system, or both. Whatever the truth, I was awed by the scale. The tree line way, way off in the distance was the northern bank. The reservoir was now largely dry, but because its floor is low and collects water before the surrounding land does, it has been divided into rice paddies. We went for a stroll, walking along paddy dikes to keep our feet dry. We said hello to members of a farming family who were tinkering with a small tractor. A woman had caught a bucketful of paddy crabs and insects, which she would sell as food. In the final daylight, we passed a group of young men bringing cattle home. I passed the night at the house of a Cambodian family, friends of a friend. They couldn't have been more gracious. They gave me a room of my own, bottled water, mosquito coils and a big luxury: a car battery hooked to a fluorescent light. I could have light all night if I wanted it. Other members of our party slept at a formal homestay, the term given to guesthouses as well as family homes that accept paying guests, a few steps from the temple's gate. It had two rooms with large beds covered by mosquito nets. Downstairs there was a basic bathroom with a squat toilet and scoop bath. Staying the night brought another cultural experience. A festival was going on nearby, and its amplified music carried into my room as I sat reading. Then around 10 p.m., silence. Private generators don't run all night, even for a celebration. I got up at dawn, scoop-bathed in slightly murky water and walked to the moat from which it had been drawn. I took in the early morning sights: the mist, dogs prowling around in first light. I played amateur archaeologist for a bit, noting that an ancient feeder or outflow channel, now dry, was connected to the moat at this corner. Later we went exploring on foot. Mixed in among wooden homes were the stone walls of lesser 12th-century relics that had been monasteries or small temples. The ruins of one temple's gate lay foliage-shrouded just a few steps from a house. Little boys ran about, and a teenage girl ironed clothing. We had breakfast at a stall in the town's market; there are no proper restaurants. It was noodle soup with chicken, and very good. I first visited Angkor in 1969. Back then, you could be alone in the big temples even there. I once walked through the largest of them, Angkor Wat, encountering hardly a soul. It's good to know that such an experience can still be had. You just have to work a bit harder for it. John Burgess is a former foreign correspondent for the Washington Post. Getting to Banteay Chhmar from Angkor takes about four hours, maybe longer. And in Cambodia you need to be game for some adventure, or at least for some delays. But other ancient sites beyond Angkor can be reached more quickly. The 12th-century temple complex of Beng Mealea lies about 1 1/2 hours by road -- a good road -- east of Angkor. Being so close, it has some tourist bustle, but nothing like Angkor's. The temple was built at roughly the same time as Angkor Wat and shares many of its style characteristics. 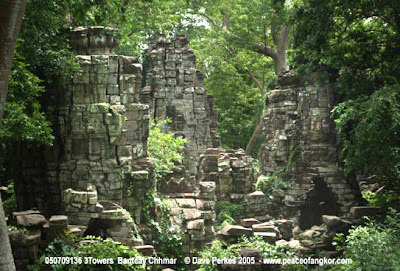 Perhaps Beng Mealea was a trial lab for the better-known temple's style. Visit and you may wonder: If the ancient Khmers had Beng Mealea, why would they need Angkor Wat? Another site, Koh Ker, lies an hour and a half beyond Beng Mealea by a generally rough road. Koh Ker is an area, not a single temple, that for centuries was a center of provincial culture. In A.D. 928, when its prince became King Jayavarman IV, the capital came to him, rather than vice versa, for reasons perhaps related to his feuding with the previous king. Today Koh Ker has dozens of stone creations, some large and imposing, some small and intimate. The most spectacular is a complex that is three temples in one, including the Prang, the largest pyramid that Khmer architects built. Faced in sandstone, it has seven levels and stands about 115 feet tall. This was Jayavarman IV's state temple. From that complex, we drove a circuit through wooded land, coming to smaller but still remarkable temples every few hundred yards. Prasat Krachap has many images of the god Shiva. Banteay Pichean has two brick towers standing in front of a collapsed central sanctuary. At those places and others, I encountered only a guard who was posted there to prevent art theft. Without question, the most spectacular of the Khmer monuments outside Angkor is Preah Vihear, built atop a 1,700-foot cliff. The visitor ascends a long stone-paved avenue, arriving at ever-larger holy buildings. At the top is the main sanctuary and, a few steps beyond, a jaw-dropping view of Cambodian countryside. But for now, Preah Vihear is best left off your schedule. Situated in Cambodia right at the border with Thailand, it has since last year been the scene of a military standoff between the two countries' soldiers. This is the latest flare-up in a long feud over the temple, which the World Court ruled in 1962 belonged to Cambodia. But if on a future trip the soldiers have left, give thought to a visit. Going from Siem Reap is daunting: perhaps five hours each way over very rough roads, then a hike or motorcycle taxi in the heat up the cliff. Accommodations are minimal. The more comfortable and common way to reach the temple, assuming the border is open, is from Thailand. Thai tour companies can make the arrangements.